The crew behind West Coast Bug Meet is a group of dedicated enthusiasts that thought it was time to arrange a bigger meeting in the south of Sweden. For some reason, the majority of us is located in Ängelholm which based a foundation strong enough in order to pull this event off. The name West Coast indicates that we are located on the west coast and the close distance to the highway (E6 & E4) makes it easy to get here. One of our goals is to lure participants from the continent. 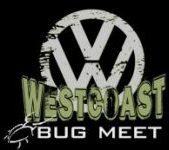 The purpose with West Coast Bug Meet is to offer a whole weekend with good fun for the whole family. A lot of work is dedicated in favour of the kids, we want them to enjoy it in order to make this a memorable weekend! Bugmeet #1 was held in 2011 and the result was over all expectations. We found the form already after Bugmeet #2, yet a little rough. After Bugmeet #5 we knew that we had found the right setup and the objective is to continue to develop the concept in order to get even better. This isn´t possible without our fantastic participants and nice and strong sponsors. All this is tighted togehter with our Bugmeet Crew that really puts in an effort for you to have a pleasant stay in Ängelholm at Lingvallen!